beautifully moody trees background sampled from a photo by Stacy Marie Keck. This month I'm going to try and remember what it means to be fearless. I've lost this ability through age and even more so since my foot injury last year. I still have physical limitations, for the moment, but I think it's time to get real with myself. No more giving excuses out of fear! "Once you set aside the fear, then it's a cinch." It's time to set aside my reservations about certain lifestyle changes and just take the first step...to get in shape and start running again...to commit to and design new items for my etsy shop...to eat healthier day to day...to be more social. Practice makes perfect on all of these things, so my attempts will only get better if I drop the fears and apply myself. to help me to become fearless?" Now, hit play and get on your way! We have nothing to fear but (useless and meaningless) fear itself. I'm not sure why, but "Unicorn" came up twice in this month's playlist. 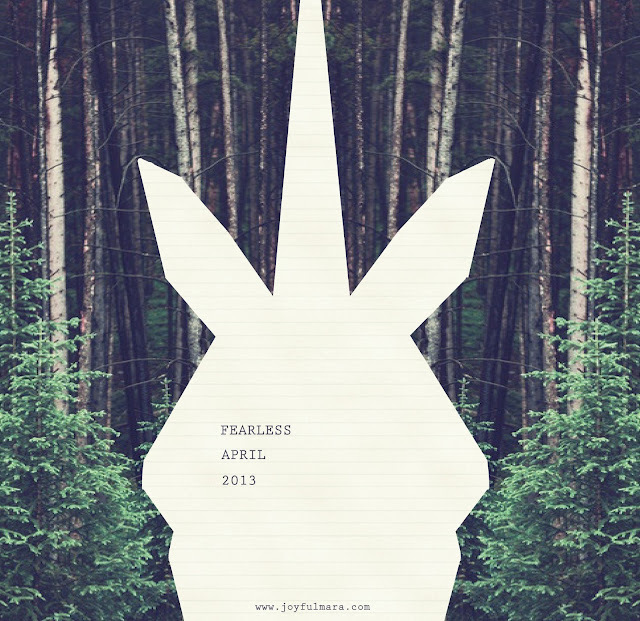 To pay tribute to that, I decide to get a little fancy with the Fearless April cover art. Fearless April 2013 from joyful_life on 8tracks Radio. I just can't get enough of April's playlist! It's SO perfectly crafted! Thank You for a fabulous playlist!! !